What's In My Summer Everyday Makeup Bag? When it comes to primer and foundation, there's nothing new to see here, but for concealer I've been loving the It Cosmetics Bye Bye Under Eye Concealer. I got this around the end of April and it's really become part of my routine, especially when I want something full coverage on my dark circles! It has a thick texture which can take some getting used to, but I warm a small amount between my fingers before patting on to my under eye area. It really brightens everything up and the high coverage means it works particularly well for spot concealing blemishes too. Now that the weather is hotting up, I've been making more effort to prolong the wear-time of my foundation. 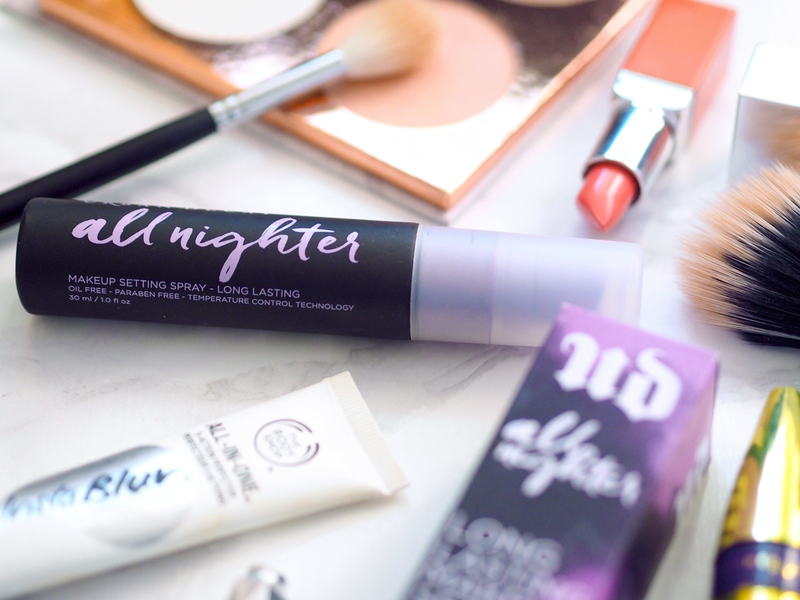 Something I've welcomed back is the Urban Decay All Nighter Setting Spray*, which has the finest mist and sets my base really well for the day ahead. I've been using a lot more powder lately, so this keeps my complexion looking fresh rather than cakey. The Maybelline Master Contour Palette has made it back into my rotation this month, and I've been really enjoying using a separate contour product rather than just using bronzer. This Medium/Dark palette has a really nice, cool toned contour shade that does a great job of sculpting cheekbones, particularly if you use the flat brush provided! 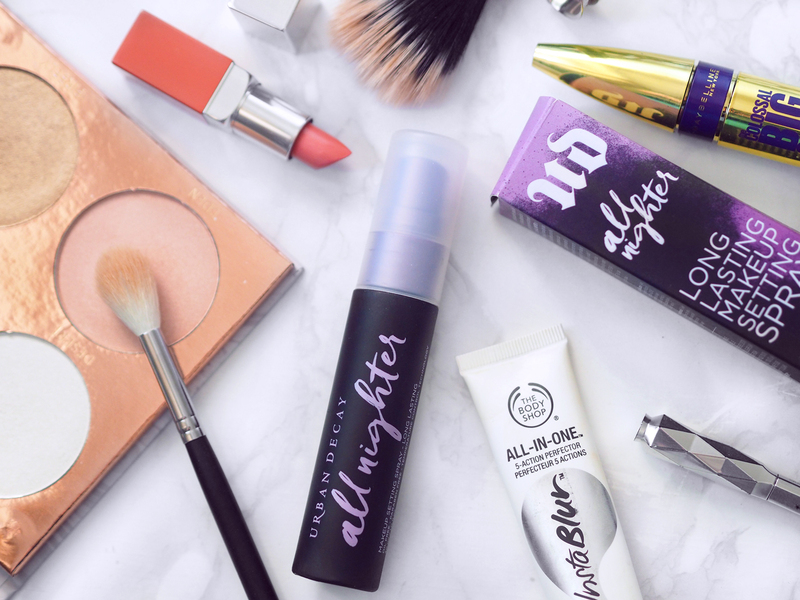 For highlighter, I've been trying out a few recently, and I was pretty impressed with the offerings from Primark (so much so that I've reached for them more than the Jeffree Star X Manny MUA Skin Frost I reviewed last month!). I picked up the Mermaid Highlighter, which is an icy white with a unique blue/purple shift, and the Pure Glow Highlighting Palette, which has 4 shades. I've been loving the white shade called Desert and the lighter gold called Glimmer, and they have this gorgeous 'lit from within' glow without looking at all glittery. The only downside however is that the Primark highlighters are not overly long lasting on the skin - they lose their 'pop' after a few hours, even when applied with setting spray. I've also been making full use of the Morphe M510 Brush, which has become my method of choice when it comes to applying highlighter. It grabs just the right amount of product and is the perfect size for the tops of the cheekbones. For eyes, I've been really enjoying playing around with the L'Oreal Infallible Eye Paints as I picked up three shades not too long ago. My faves are Sunset Goals, which is a matte orange, and Cocky Bisque - a shimmery gold. Sunset Goals makes a great base for a warmer bold eye look, or simply all over the lid with a matte brown in the crease for everyday, and Cocky Bisque is great as a base for gold shadows to intensify the look. I've tried A LOT of mascaras recently, but one that I've been coming back to is the Maybelline Colossal Big Shot*. I'm not usually into natural bristle mascaras, but this one has a great wand which really gets into the root of the lashes to provide a good amount of volume, curl and length with this amazing fluttery finish which I've only ever gotten from false lashes! The main new addition lately has been my first Jeffree Star Cosmetics Velour Liquid Lipstick, which I picked up in the shade mannequin. It's easy to apply with a comfortable formula, and I'm obsessed with the shade. It has just the right balance of pink and brown tones, and is such a 'my lips but better' shade. For days when I've not been wearing liquid lipstick, I've gone for a more natural approach. I've been reaching for the Barry M Lip Liner in Pose which, if you've seen my Kylie Lip Kit Dupes video, you'll know I wasn't overly excited by. It lacks in creaminess and pigmentation, but this actually works in its favour, making it the perfect shade for over lining your lips. I like to then pat the Essence Sheer & Shine Lipstick in 09 I Feel Pretty over the top, which is a deep rosy shade, for a natural flush. What have you added to your makeup bag recently? That highlighting palette looks stunning! And I've been wanting to try that It Cosmetics concealer for quite a while because my dark circles are terrible haha maybe I'll pick it up soon! This post was so useful! I'm thinking of getting the UD spray so now I really need it!